Resourcefulness has transformed Washington agriculture. In only a few generations, Washington farm families transformed our state into one of the major food producers for the world. Washivore celebrates the “spirit” of Washington agriculture characterized by resourcefulness and innovation. While there are over 300 different crops grown here, wheat and apples are perhaps the most familiar and reflect the progress of agriculture over the last hundred years. One job requiring skill back then was to sew bags shut as they were filled with ripe grain. The bags were then carted to sheds to be stored. 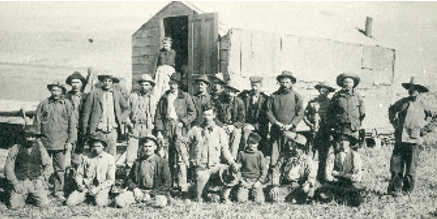 The grandfathers and great-grandfathers of today’s farmers used to harvest wheat with a 22-horse team and a crew of about two dozen men and boys. Harvesting on slopes was very dangerous. Grain harvested today is stored in elevators to await transportation to market by rail or barge. Washington farmers have always been quick to adopt changes and embrace new knowledge. The video above explains how this characteristic has allowed farming to continue supporting communities into the future. The charts below show the impact modern farming techniques have had on wheat harvest. Statistics on historic wheat production in Washington available here. Feeding the men it took to harvest wheat at the beginning of the 20th century took a special kind of resourcefulness. The cooks would drive the wagon out to the fields and have food ready by the time the horses came in for watering and feeding. The "spirit" of Washington agriculture permeated the noon-time meal. Taste the past. The recipes below were popular with farm cooks in the 1890's. After just a few generations of innovation and imaginative marketing, Washington farmers have had a powerful impact on today's popular food culture. Entire television shows are dedicated to showcasing food produced in Washington. Click on the video below to watch an episode of Washington Grown featuring our state's apple crop. Celebrity chefs and nutrition-consciousness are hallmarks of these modern recipes. Washington’s oldest fruit orchards date back to the mid-1870’s when pioneers brought fruit saplings from their farms in the Midwest. The fruit trees found ideal growing conditions in the long sunny days, cool summer nights and soils with volcanic ash in Central Washington. 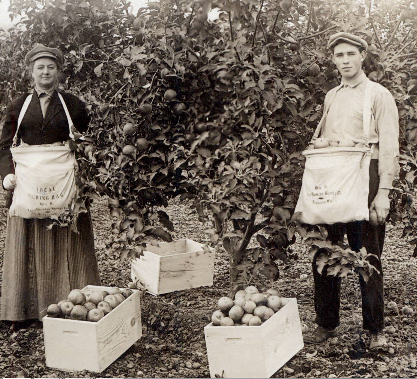 Soon, orchards were set up in the region and fruit packing houses sprang up in small towns along the railroad lines. As irrigation canals were dug, more water became available and apple orchards quickly spread. Photo courtesy of the Yakima Valley Museum circa 1905. Apple packing has seen a huge benefit from innovation in technological engineering. Apple grading, for example, no longer must be done entirely by hand. This has resulted in better quality fruit available to the markets with less labor cost. The charts below show the impact modern farming techniques have had on apple production. Not only have acres and pounds increased, a tremendous change has taken place in the many products we can make from apples now. For historical data about Washington's apple crop click here. More varieties of apples are available today for the fresh market. Methods for harvesting apples have not changed as significantly as other aspects of agriculture. In the future, innovative thinking could lead to dramatically different approaches to harvest. Spokane Library NW History collection. The Spirit of Washington agriculture has always been about innovation. It’s about finding new ways of tackling old problems. 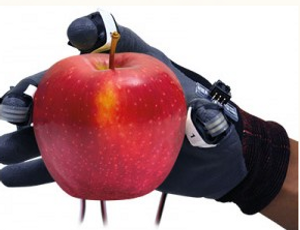 In the future, apples may be harvested by computer-aided robots controlled by one person at a computer screen. The human-robot partnership may allow fruit to be harvested by just a few orchard workers.